Our commitment to you: We are more than just an information and product website. We strive to stay in touch with all the latest research in hair loss so you can make an informed decision. When you buy from us you are getting more than just a great product at a good price, you are getting support and guidance (email us) while treating your hair loss. 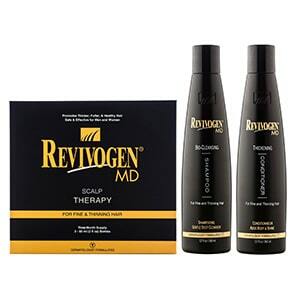 Revivogen MD is an all-natural treatment for hair loss. It has not gone through FDA clinical trials like Finasteride and Minoxidil, but Revivogen’s ingredients have been scientifically proven in independent studies to lower DHT production. Propecia and other prescription pills on the market today for hair loss inhibit DHT production internally throughout the body. As mentioned, in the All about hair loss section of the website, DHT production is the mechanism in the body that causes the hair follicle to become dormant. A topical solution, such as Revivogen MD inhibits the DHT production directly from the hair follicle. The topical versus pill form do the same thing essentially; they just go about it in two different ways. Board-certified dermatologist Alex Khadavi, M.D. selected Revivogen MD’s active ingredients because they are natural compounds that have been proven to inhibit 5-alpha reductase (the enzyme necessary for DHT production). Revivogen MD’s ingredients include gamma linolenic acid (GLA), alpha linolenic acid (ALA), linoleic acid, oleic acid, azaleic acid, vitamin B6, zinc, saw palmetto extract, beta-sitosterol and procyanidin oligomers. Click here to learn more about the ingredients in Revivogen MD. After evaluating the studies Revivogen MD has performed (evaluating its success rate) and the study it did to prove that topical Revivogen MD inhibits DHT production greater than topical Finasteride and topical Dutasteride (see News releases), it is this website’s opinion that this is a great product. It is worth a try for those that like an all-natural no-side effect alternative. This is a product that can be used by men and women and has been shown to work on the entire scalp, including the hairline. My experience and opinion on this product: I consider this product to be a very strong hair loss treatment, one of the best. My product (4hairlossMen and 4hairlossWomen) contains some of the same ingredients as Revivogen but at different concentration levels. Like my product, this product contains ingredients that inhibits the production of DHT and stimulates hair growth, which is what you want in a product. It is priced well compared to other hair loss products. My only issue with this product is it leaves your hair and scalp greasy and it is strong smelling; I only tested this product for a few weeks because of the consistency. You can use the product at night but you will need to wash it out every morning. I had a hard time washing it out every morning, almost like it left a residue on my scalp, but mainly I just don’t like showering in the morning, so it didn’t fit my lifestyle. Also, not everyone likes to wash their hair every day, especially women, but with Revivogen you will want to. If you don’t mind the consistency and having to wash your hair every morning then this is a very good product to try. Includes a 90 day supply of Revivogen MD Scalp Therapy, 1 bottle of Bio Cleansing Shampoo, and 1 bottle of Thickening Conditioner. Domestic (United States) shipping only. At the request of the manufacturer we are unable to ship Revivogen MD internationally. Best Price Guarantee: Find the identical item for a lower price (from an authorized seller) within 30 days of your purchase and we will match the price. Just send us a copy of the ad and we will refund you the difference.